Over 165 Years of Excellence. Horace Smith & D. B. Wesson form a partnership to manufacture a firearm that can fire a fully self-contained cartridge. The first American firearm capable of firing a fully self-contained cartridge was manufactured by Smith & Wesson in 1852. This repeating pistol fired as quickly as the shooter could operate the lever and it was dubbed “The Volcanic,” since the rapid-fire sequence appeared to have the force of an erupting volcano. Originally called the Seven Shooter, the Model 1 was introduced in 1857. This .22 rim fire revolver was the first practical cartridge revolver and its introduction heralded the end of percussion firearms. Introduced in the summer of 1870, the Model 3 American was the first large caliber, centerfire, cartridge revolver manufactured in the United States. By 1880, the demand for self-cocking revolvers was so great that Smith & Wesson introduced a complete series in three different caliber sizes. In the early 1880s, D.B. Wesson and his son, Joseph, began developing a revolver that didn’t have an external hammer. The Safety Hammerless, which debuted in 1887, was the world’s first double action concealed hammer revolver. In 1899, Smith & Wesson introduced what would become its most successful revolver, the .38 Military & Police. Everything about this firearm was innovative, from its solid frame and its hand ejector system to the cartridges it fired. The .38 Military & Police, now known as the Model 10 revolver, has been in continuous production since 1899, and over six million units have been produced. After years of development and testing, Smith & Wesson produced its first automatic pistol on May 3, 1913. The .35 Automatic featured two safety devices and was available in blue or nickel for $16.50. The odd caliber and production stoppages due to the more important war time production of World War I, kept sales of the .35 Automatic relatively low. A total of 8,350 units were manufactured until 1922. Initially conceived of as a custom-built, heavy load, deluxe handgun in 1934, the .357 Magnum revolver quickly caught the interest of law enforcement agencies. Handgun cartridges of the day could not penetrate bulletproof glass and armor-plated vehicles, but the .357 Magnum cartridge could. Many of these revolvers were purchased by numerous law enforcement agencies, such as the Federal Bureau of Investigation. During World War II, the British Commonwealth approached Smith & Wesson for revolvers. The guns, which were basically an updated version of the .38 Military & Police revolver, were eventually given a V prefix on their serial number and called Victory Models. By the war’s end, Smith & Wesson had made over 800,000 revolvers for Allied troops. This small revolver, designed primarily for plainclothes and off-duty police officers, made its public debut at a police conference in 1950. At the conference, the Smith & Wesson sales force asked the police chiefs to vote on a name for the new revolver. The most commonly suggested name was .38 Chiefs Special. In 1955, the first American-made double action auto-loading pistol, the Model 39, was introduced. In 1968, the Illinois State Police adopted it and the Model 39 became the first 9mm Double Action auto-loading pistol ever used by any state law enforcement agency in the United States. At the urging of handgunner Elmer Keith, Smith & Wesson developed the .44 Magnum. Completed in 1955, the .44 Magnum revolver was originally available in two barrel lengths, 4 inches and 6 ½ inches. The model sold well and in a few years a third barrel length of 8 3/8 inches was added. Demand for the firearm decreased in the 1960s but skyrocketed in the 1970s after the release of the film, Dirty Harry, starring Clint Eastwood. In 2005, Field & Stream rated the Model 29 revolver as the 5th best gun ever made, the only handgun to make their top ten. Prior to World War II, most competitive shooters shot revolvers. After the war the trend to use autoloaders became more popular. Smith & Wesson began the development of a high-grade .22 caliber rim fire target pistol in the late 1940s. The pistols were heavily tested, adjusted and modified for almost ten years. Finally, in 1957, the Model 41 pistol was made available to the public. In 1960, the U.S. Army Marksmanship Training Unit asked Smith & Wesson to build a pistol similar to the Model 39 pistol that could fire the newly developed .38 AMU cartridge. The Model 52 pistol was the most accurate target pistol of its day and featured an innovative ball-bushing barrel. The Model 60 revolver was the first stainless steel handgun manufactured by Smith & Wesson. Originally available in a highly polished finish, the finish was changed to a satin polish after law enforcement agencies objected to the bright finish. Smith & Wesson debuts the first of the Second Generation pistols, updated and stainless steel versions of the semi-automatic pistol line. The Model 439 pistol is an updated version of the Model 39 pistol featuring an alloy frame. It is a Second Generation semi-automatic pistol, denoted by the three digit model number. First generation models have a two-digit model number, Second generation models have three digits, and Third generation models have four-digits. With 42 models in 121 variations, Smith & Wesson’s Third Generation Semi-Automatics were the broadest handgun line in the world. The Model 4006 is a 3rd Generation pistol first introduced in January 1990 alongside the new .40 S&W cartridge. The .40 S&W cartridge was developed jointly with Winchester in collaboration with the Federal Bureau of Investigation, who had requested a 10mm cartridge loaded to less-than-full-power. The result was the shorter .40 S&W that allowed for a more comfortable grip when used in a double-stack magazine. Early detractors doubted the viability of the cartridge, but today it is one of the most successful law enforcement cartridges. An entirely new frame size was developed to fire the new .500 S&W Magnum cartridge. The Model S&W500 revolver is the biggest, heaviest, most-powerful factory production, double action revolver in the world. Smith & Wesson debuts the M&P Pistol Series, a new line of polymer-frame pistols. Championed by law enforcement officials, the new line is adopted by over 100 departments in its first year. The M&P15 rifle, a modern sporting rifle, was introduced. 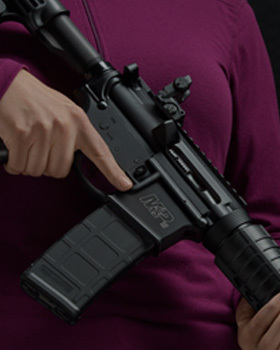 It is first in the highly successful M&P® Rifle Series. Introduced in 2009, the M&P15-22 rifle offers the fit and feel of the popular M&P15 rifle, while chambered in the more economical .22LR ammunition. In 2010, ground-breaking rifle received the “Rifle of the Year” award from the Shooting Industry Academy of Excellence. This slim, concealable, lightweight, striker fired pistol is released. Within three years, one million of these pistols were manufactured. 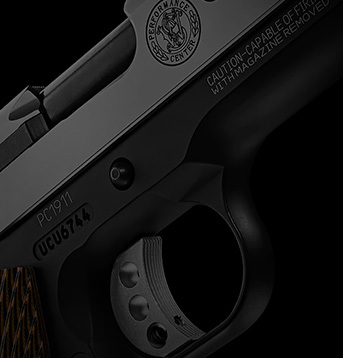 The SW22 Victory, a modular design, metal-framed pistol with fiber optic front and rear sights. This highly customizable and incredibly accurate blow back .22 pistol will keep you on target round after round, and provide years of unmatched performance. Building on the proven reliability and success of the M&P pistol series, M&P M2.0 pistol is the culmination of a decade of research and design. Designed for professional, personal and sporting use, the M&P M2.0 pistol features upgrades to nearly every aspect including trigger, grip, frame, and finish.